The gorgeous mural that hangs on the back wall of Ren Wen Noodle Factory features people of all ages and races indulging in piping hot bowls of noodles. Ren and wen: Two words used commonly in the Chinese language, meaning people and culture, respectively. Combine the two words and the phrase translates to “How people think and what people like.” While people express different thoughts and view the world differently, the one common bond that unites everyone is food. But, which food acts as that great unifier that connects the West to the East, the businessman to the construction worker, the 80-year-old grandma to the kindergarten student? Noodles! Ren Wen Noodle Factory, a brand new restaurant that opened just two weeks ago at 7 Great Neck Rd., aims to connect a community of like-minded people who share the same love of noodles. The restaurant hopes to expand an “evolving noodle culture” and to “establish a new standard for quality noodles” by creating new dishes inspired by both local and global food trends. Owners Ching Sun Wong and Stanley Wong created a restaurant modeled on noodles bringing together people of all ages, races and sexes. Both are principals at Wonton Food Inc., one of the country’s leading wholesale producers of noodles and dumpling wrappers, ensuring that ingredients are of highest quality possible. This attention to detail is seen throughout the restaurant’s modern decor: Wooden tables are covered with candles, soy sauce and bright red hot oil; metal stools provide a contemporary ambiance to the brightly lit dining room; menus are displayed on small televisions that are situated above the spacious counter; and an open kitchen filled with state-of-the-art equipment. 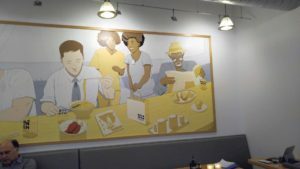 The defining feature of this restaurant is a gorgeous mural depicting people of all ages and races indulging in piping hot bowls of noodles, a testament to the premise this eatery was founded on. Although orders are placed at the counters, waiters bring food over to the tables—and the service is fantastic; everyone was smiling and accommodating. The menu features a variety of creative takes on traditional Asian delicacies. Appetizers ($4 to $7) range from pickled vegetables to sticky ribs prepared with spicy Gochujang pepper sauce with house-made kimchi to tiger prawn dumplings. The only salad, kale and apple ($7), combines Asian ingredients, like Kimchi apple vinaigrette, with local ingredients, such as heirloom tomato and asparagus. The soups ($12 to $14), reminiscent of ramen, each feature an array of ingredients not typically found together, such as five-spice chicken with spinach, carrots, seared mushroom, onion and corn. Sauce noodle bowls ($9 to $13) consist of different styles of noodles like soba or flat chow fun-esque noodles with accompanying meats and vegetables like minced pork with Vidalia onion and Sichuan peanut. I tried the Three Little Pigs, a soup bowl with pork belly, pulled pork American BBQ style, braised mushrooms, caramelized onions and roasted corn, all in a golden chicken and pork broth. The soup had a perfect balance of savory from the pork to sweet from the onion and corn to spicy from a bit of hot oil. Ramen noodles were perfectly springy, the pork belly had a nice balance of meat to fat and the pulled pork added an interesting Western element to a Japanese-inspired dish. 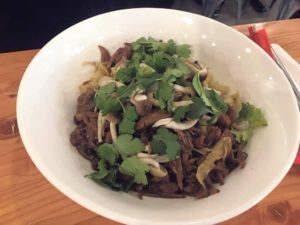 I also sampled Grand’s short ribs, a noodle bowl with “Grandma’s noodles,” which are similar in shape to chow fun, topped with Chinese celery, cilantro and pickled mushrooms. The noodles, yet again, were stellar, and the beef had a pleasant aromatic taste from the cilantro. Although Ren Wen places an emphasis on its homemade noodles, the inviting ambiance, friendly staff and creative risks the owners took when crafting the menu highlights how the overall dining experience, not just noodles, unites the community and elevates the traditional approach to Asian cuisine. 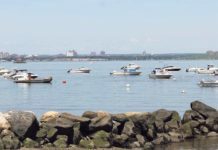 Noah Sheidlower is a senior at Great Neck South High School who loves food reviewing and culinary writing.